Four Year Varsity Starter – Career record of 76 wins – 19 losses, 25-4 vs 4A teams. 1217 Career points – Ranked 5th all time in scoring at Evansville Memorial. Over 130 career 3 ptrs. 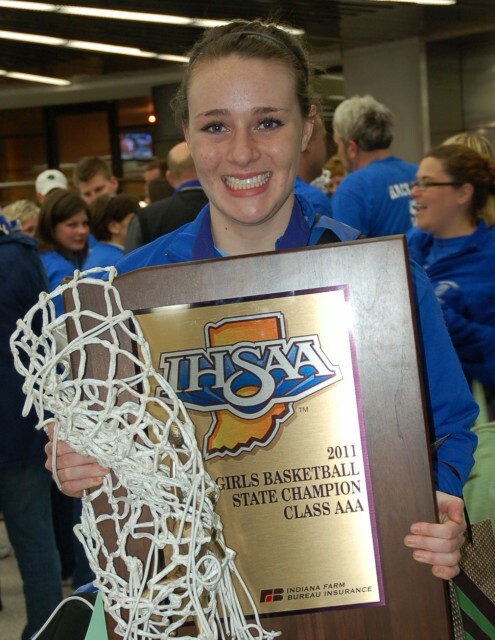 Junior Season – 28-1 record, Indiana 3A State Champions, Semistate Champions, Regional Champions, Sectional Champions, Undefeated Conference Champions, Conference Tourney Champions, Indiana Hall of Fame Runner Up, Final Sagarin Ranking #1 in 3A, 4th Overall. Travel Team – The Family Inc. Recognized by ESPN/Hoopgurlz 6 times during career – Scouts Grade of 82 – 112th among PGs nationally. Class Basketball All Star Classic – Junior Team – Scored 14 pts in 4 pt win. Career GPA 5.9/6.0 (unweighted). 6.0 GPA Senior season – AP classes. Overcame ACL reconstructive surgeries on both knees during High School career; left knee – Sophomore, right knee – Junior. ” Natalie has a tremendous basketball IQ, and when she is on the floor it is like having another coach out there. She played with our program from 7th grade up through her senior year and will always be part of our Family”.